Anne Salisbury, Michael Tamura and Greg Meyerhoff with orbs in Boulder, Colorado. Can you find the orbs? In the summer of 1996, I (Anne Salisbury) interviewed someone from California who wanted to teach for our Transpersonal Hypnotherapy Institute. Over lunch she mentioned that her spiritual teacher, Michael Tamura, had just moved to Colorado the week before. Out of curiosity, I called him for a psychic reading, and was impressed with his neutral approach to spiritual development. In 1999 Greg joined me in Michael’s classes, and in 2000 he, and his wife Raphaelle, joined us for our wedding in the mountains of Colorado. We have enjoyed their company ever since. To give you some background, Michael began studying psychic tools in the 1970’s with Lewis Bostwick, founder of the Berkley Psychic Institute. He has since taught classes around the world on how to be clairvoyant and how to live a more spiritual life. He trained us and, in turn, we have taught these Intuitive Skills through the Transpersonal Hypnotherapy Institute and Go Intuition since 2001. You may have seen Michael on CNN, NBC’s The Leeza Show and recently on The Ricki Lake Show with James Van Praagh. 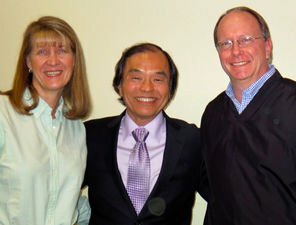 Anne Salisbury, Raphaelle Tamura and Greg Meyerhoff enjoy being together again! 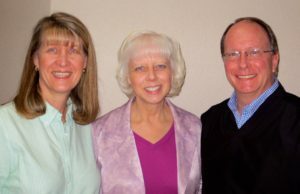 Michael, along with his wife Raphaelle, are pioneers in soul-centered education. His book, You Are The Answer, is illuminating. As he says, you have access to all the answers you need if you only ask your inner knowingness for guidance. The word intuition comes from the Latin word for learning and contemplating rather than intellectually thinking. We all have a variety of intuitive abilities that correspond to the chakras, such as “gut feelings” in the belly. The highest form of intuition is intuitive knowingness, which is accessed through the crown chakra at the top of the head. This latter form of intuition brings with it the certainty that you know. As children, we were all invalidated for knowing things without knowing how we knew. We were told that we had to have “reasons” and also to rely on other’s knowledge rather than our own wisdom. It is now time to trust ourselves more and to heal those old wounds. Ground your consciousness to the center of the earth to stabilize your intuitive abilities. Be present. Center your awareness in the center of your head behind your eyes in your intuitive center. See the light there. Use your psychic abilities. Your intuition is an ability intrinsic to your soul, not your body. Develop your knowingness further through meditation. Go within. When you access your inner truth, you access your inner certainty. When you focus on the outer world or others, you access mind chatter. And that has no certainty. When you distrust your intuition, you are accessing fear and other thoughts, not intuition. So you want to ground out those thoughts and return to trusting yourself.It is really important to ask the right question. Rather than focusing on “What is wrong with me?” which brings about self judgment, be neutral, forgive yourself and look at all experiences as something from which you can learn. Your soul growth and wisdom comes from experience. So, look within for happiness. Choose happiness. Know that it is already within you. Do not expect that an outside event must happen before you can be happy. Stop looking for something to make you happy. Share the happiness that is already within you. You experience happiness when you share what you have. Learn More about Michael Tamura and his workshops: www.MichaelTamura.com. Read his book: You Are The Answer.